Jenny Evans, Maths and Physics Librarian, Imperial College London and myself have had a poster presentation accepted for the LILAC 2014 conference which will be held at Sheffield Hallam University on 23-25 April 2014. The title of the poster is “Are institutions preparing staff for digital life beyond the institution?” We had originally submitted a proposal for a symposium which would be based on a survey of institutional policies on digital literacy related to use of Cloud services and invite LILAC 2014 participants to discuss the survey and the implications of the findings. However the reviewers accepted the proposal as a poster which would focus on the survey findings. This blog post summarises the background to this work, outlines the findings of the survey and poses questions on the role of university libraries for preparing staff and researchers for use of networked technologies to support their professional interests once they have left their host institution. In this talk Brian Kelly describes the challenges to be faced when, due to withdrawal of funding, one is faced with the challenge of continuing one’s professional interests when a local institutional IT infrastructure is no longer available. The presentation was prepared whilst I was preparing for redundancy, following the announcement of the cessation of Jisc funding for UKOLN, my host organisation. As can be seen from the slides (which are hosted on Slideshare) I gave a personal account of the challenges to be faced when the IT infrastructure, the support services, the email addresses and the means for authenticated with Cloud services is about to be lost. However since I was an early adopter of a wide range of Cloud services I found myself in the fortunate position that I was not over-reliant on institutional IT services. I also had the time to migrate content and services so that I did not lose the ability to continue my work once I had left my institution. I should also add that since most of my content is licensed under a CC-BY Creative Commons licence there should not have been licensing barriers to my continued use of content I created. When I gave the presentation I asked if my comments on the importance of preparing members of staff and researchers with the skills and confidence to make use of Cloud services when they leave their current institution especially if, for example, they are being made redundant or their funding finishes and they wish to continue to make use of their professional skills. There seemed to be agreement that information literacy (or digital literacy) should encompass this area. Howe er there was also a recognition that none of the institutions represented in the session a year ago were addressing this area. In light of last year’s presentation it was felt that it would be useful to provide a more comprehensive survey across the sector to determine the extent to which institutions’ informal literacy policies and practices address use of Cloud services and whether support is given for staff and researchers when they are about to leave their host institution. Jenny Evans, Maths and Physics Librarian at Imperial College London agreed to submit a proposal for the LILAC 2014 conference based on this work. We submitted a proposal for an hour-long symposium with the intention of using the findings to stimulate discussion and debate. However the proposal was accepted as a poster display so it will not be possible to address the implication of our work in a formal context at the conference. This blog post summarises the survey and the findings. Comments and feedback are welcomed. This survey aims to identify institutional policies and practices to support use of Cloud services by staff and researchers. Cloud services can be defined as ‘web-based software’ hosted in ‘the cloud’ (on web servers outside your institution). This survey is being carried out by Jenny Evans (Imperial College London) and Brian Kelly (Cetis, University of Bolton) to support a contribution for the LILAC 2014 information literacy conference. The aim is to identify current institutional policies and practices for staff and researchers before they leave their host institution (e.g. due to redundancy, retirement or to take up a new post) who wish to continue to make use of IT services and digital resources. The findings will be published in a poster on “Preparing our Users for Digital Life Beyond the Institution” to presented at the LILAC 2014 conference. Note: this does not cover use of cloud services by taught course students. We received 89 responses during the 2 week period. A poster has been prepared based on the findings which is illustrated (and is available from Slideshare). This post provides additional information. The majority of responses (54 or 63.5%) were from the UK with 20 (23.5%) from Australia, 11 (13%) from the USA and Canada and 3 from other countries. [85 responses; 4 respondents did not answer this question]. The vast majority of responses (80, 96.4%) were from staff based in libraries with 2 responses from researchers, 1 from IT Services staff and 6 from other departments. [83 responses; 6 respondents did not answer this question]. In response to the question “What forms of support are provided to staff and researchers in the use of Cloud services?” it seems a diversity of approaches are taken as shown in Table 1. [58 responses; 31 respondents did not answer this question]. Table 1: What forms of support are provided to staff and researchers in the use of Cloud services? We went on to ask “Who provides formal training and support for members of staff and researchers in the use of Cloud services?“. From the results given in Table 3 the most interesting observation is that the vast majority (66%) of respondents report that no formal training or training is provided. [56 responses; 33 respondents did not answer this question]. Table 2: Who provides formal training and support for members of staff and researchers in the use of Cloud services? We sought a context to these questions when we asked “Does your institution have a formal information/digital literacy policy?” The findings are given in Table 3. Table 3: Does your institution have a formal information/digital literacy policy? Since only 19 of the 89 responses (21%) have a (or are aware of) their institutional formal information/digital literacy policy the answers for the following questions will only be relevant to a minority of the respondents. 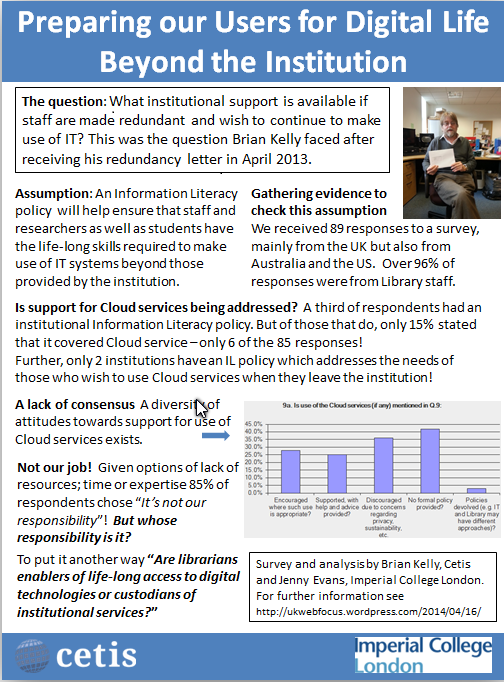 We asked “If you have an institutional information/digital literacy policy, does it cover use of Cloud services?” and “If information/digital literacy policy, does it address the needs of staff and researchers who wish to continue using IT services when they leave the institution?“. The findings are given in Tables 4 and 5. Table 4: If you have an institutional information/digital literacy policy, does it cover use of Cloud services? Table 5: If you have an institutional information/digital literacy policy, does it address the needs of staff and researchers who wish to continue using IT services when they leave the institution? We were interested in the extent to which institutions had institutional licences for Cloud services such as Google Apps for Education, Microsoft Live and Dropbox. The findings are given in Table 6. Table 6: Does your institution have a formal institutional licence for Cloud services for use by your user community? The context for this questions was the potential danger that content hosted in a Cloud service managed by the institution may not continue to be available to the content owner after they leave their host institution. From the findings given in Table 7 it seems that content will not be accessible in this situation or the status regarding continued access is uncertain. Table 7: Will access to content held on Cloud services continue to be available when staff leave the institution? 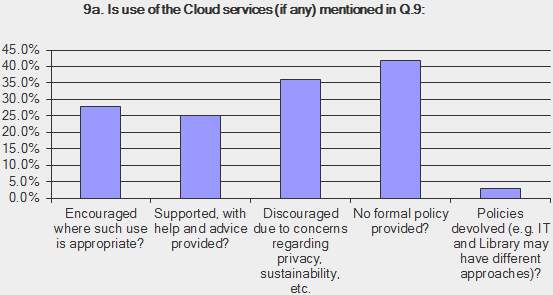 The survey provided an opportunity to understand current policies and practices taken regarding use of Cloud services. As can by seen from the findings in Table 8 and illustrated in the accompanying diagram there appears to be no consensus across the sector on policies and practices. Table 9: When staff/researchers leave your institution do you provide any formal training/support? What are the reasons given for the lack of formal training or support to prepare staff and researchers for digital life beyond their current institution. When asking the general question why new areas of work are not being addressed there are a number of responses which might be expected including a lack of time; a lack of staff resources; a lack of relevant expertise or “it’s not our responsibility”. As can be seen from Table 10 and the accompanying image, in this case providing formal training in use of Cloud services for staff and researchers who are about to leave the institution is not the responsibility of the Library. Table 10: If you do not provide any formal training/support, why not? Do the findings reflect the policies and practices for your institution? Would you agree that it is not the responsibility of library staff to provide such support and training? If it is not the responsibility of the library, then who, if anyone, should provide such support? If you have an interest in this subject and are attending the LILAC 2014 conference to be held at Sheffield Hallam University on 23-25 April 2014 I will be providing a poster display about would during the poster exhibition which will take place from 11.00-11.45 on Thursday 24 April. I’d be happy to chat. This entry was posted on 16 Apr 2014 at 10:00 am	and is filed under information literacy. Tagged: LILAC2014. You can follow any responses to this entry through the RSS 2.0 feed. You can leave a response, or trackback from your own site.